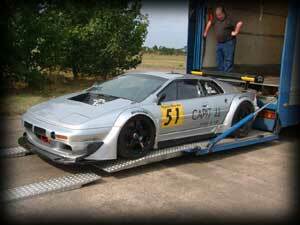 The whole of this project has been modelled on the final evolution of the Esprit V8 race car. Many of the modifications vary slightly from the original version of the V8 racer that was first saw service in the 1996 BPR series. Some of these changes have been brought about throught changes in racing regulations, while others have been due to positive developments. 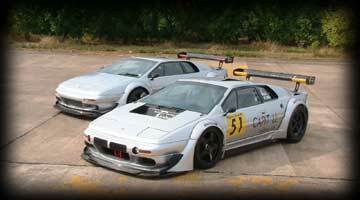 It had always been a dream of mine that my humble project car might one day sit alongside the real race car. This dream became a reality in September ´03, when Mike Haines Racing offered to arrange such a meeting. Very close to the MHR workshop lies the now disused Throckmorton airstrip. This airstrip saw active during the WWII but now acts as a Transport Depot. 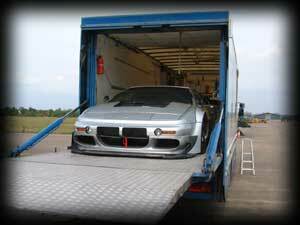 After obtaining clearance to use part of this strip for a photo shoot, we drove in convoy  the racer taking the trip in it´s purpose built transporter, while I trundled behind in my replica. Once upon the strip, we removed the race car and lined the two cars up for some photos. 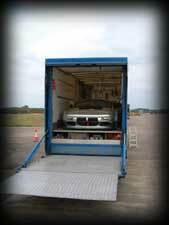 Actually getting the car out of the transporter takes some car as it´s a fairly tight squeeze. The race car is a really fantastic machine and I felt a genuine moment of pride when the two cars first lined up together. I then proceeded to spend a very happy 90 mintes shooting both cars from all angles and just looking at the race car. Eventually the light started to fade and it became time to take the race car back home. 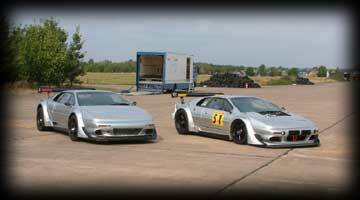 Having been spoilt by the opportunity afforded by MHR, I´m now looking forward to the NMTV Documentary filming day when the two cars will meet again and hopefully drive alongside each other on the same strip where they first met.